$ABC$ is an acute triangle which is inscribed circle $(O)$. A line through $O$ cut $AB,AC$ at $M,N$. Prove that circle with diameter $BN$, circle with diameter $CM$ and Euler circle of traingle $ABC$ concur. I don't know the way to solve this. I think it is impossible to use basic Euclid geometry theorem. There are lots of points on circles, where we can use pascal theorem, but how to use? Please solve me the added geometry factor to draw. Thanks. 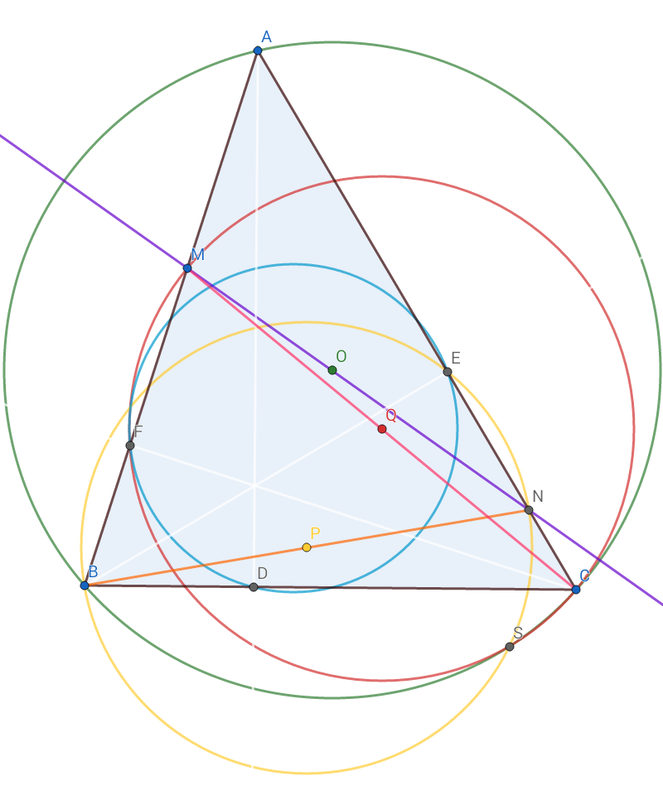 Proof that every polygon with an inscribed circle is convex? Proving the existence of first isodynamic point. Show that three point $G,H,G_1$ are collinear.